Written by a top scholar in the field, American Film: A History gives students a thorough understanding of the fascinating intersection of artistry and economics in Hollywood cinema from the beginning of film history to the present. In what ways do films influence and interact with society? What social forces determine the kinds of movies that get made? How do movies reinforce—and sometimes overturn—social norms? As societies evolve, do the films that were once considered ‘great’ slip into obscurity? Which ones? Why? These questions, and many others like them, represent the mainstream of scholarly film studies today. In Engaging Cinema, Bill Nichols offers the first book for introductory film students that tackles these topics head-on. Published in a handy 'trade paperback' format, Engaging Cinema is inexpensive and utterly unique in the field—a perfect complement to or replacement for standard film texts. 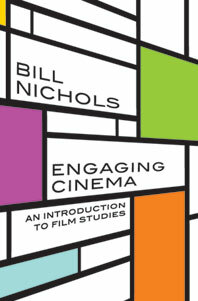 Engaging Cinema offers a brisk and helpful one-chapter overview of the basic principles of film form (and a thorough glossary that includes formal terms and concepts), three chapters on the three major categories of film form (avant-garde, documentary, and narrative fiction film, in that order), and seven chapters on various social aspects of cinema—such as stereotyping, ethnicity, masculinity, feminism, and ideology. No other book devotes this amount of space or attention to the subject. Engaging Cinema gives beginning students an entree into the world of film studies that is not only understandable and engaging but also an accurate reflection of the sort of work that film scholars do. In a standard paperback trim size, and with no pictures, Engaging Cinema feels and looks like a 'real' book, not a textbook. Engaging Cinema also has the price of a trade paperback. It's an affordable supplement to or replacement for other reading materials and can be deeply discounted when packaged with any of Norton's film textbooks.